The shutter speed is simply the length of time that the light hits the film or sensor allowing the image to be recorded. Each variation in speed (much the same as the aperture variations) is known as a stop. You can get really creative with varying shutter speeds as we shall see in a moment. However, there is one important factor that you should always remember. As mentioned in the Aperture chapter, whenever you adjust the speed of the shutter up or down, you must compensate in some other way. This is normally done via the aperture but you can also do it via the ISO setting. Or use of filters. Your style of photography and what you wish to photograph play the biggest determining factor in what shutter speeds used. If you haven’t read it already, the following page at All Things Photography explains a bit more: Shutter Speeds at All things Photography. If you are a keen sports or wildlife photographer, you will inevitably be using a fast shutter speed much of the time. But what about those times when it just isn’t possible? For example, have you ever paid close attention to the crowd during a big football match at night? Have you seen the hundreds of flash guns going off from people in the crowd? People who are much too far away for the flash to actually do any good, making fast shutter speeds redundant. More often than not the images will be underexposed or have serious camera shake. This is due to long exposures or slow shutter speeds, giving blurred pictures. The main reason for this is that they are probably using fully automatic cameras. These tend to recognise the failing light and try to compensate with a slower shutter speed. They may also add full power flash, albeit without success. What if you are trying to capture a wild animal, (again out of reach of the flash) in the early morning. At a time when the sun is barely up and the camera just won’t allow a fast enough shutter? Note: In the days before digital, "pushing" a film was the term used when you underexposed an entire film in order to get a faster shutter speed. Say the best exposure you could get was 30th/sec at F2.8. You could increase the ISO on the camera from 100 to 400 giving you 2 extra stops - 125th/sec at F2.8. However, the film would be underexposed and unless you told the lab to compensate, the images would be ruined. What the lab would do is adjust the developing times to allow for the adjustment of ISO at the time of shooting. This means that the images would be fine but a little "grainy", similar to digital "noise" nowadays. All very complicated and time consuming! The beauty of digital SLR’s is that you can adjust the ISO sensitivity for each individual shot without all the hassle of the above scenario. So, when the light is bad and your aperture is already wide open, to get a faster shutter to capture the action, simply increase the ISO to compensate. Again, one stop alteration in ISO (say from 100 to 200), will give you one extra stop of speed. From 60th/sec to 125th/sec for example. This will inevitably increase the noise in your shots. However, in most cases, this can be removed to an acceptable level using programs such as Neat Image. Slower shutter speeds are normally used and/or needed for landscape, architectural, night, still life or "special effect" photography. Most of these subjects need good depth of field. The only way to achieve this is to have smaller apertures of F16 or less. As discussed earlier, the "knock-on" effect of this is slower shutter speeds. You will always see the top landscape photographers using a tripod. This is because the best light for landscape photography is early morning or early evening when the sun is less intense. A small aperture is needed to get the best depth of field meaning slow speeds, hence the need for a tripod. The same goes for architectural photography. Especially interior shots where you want to use the low but natural light to enhance the mood of a scene. Have you ever wondered how to get shots like the lightening shot below? I wanted to use a small aperture for two reasons. Firstly, I needed good depth of field to ensure that the lightening and buildings were sharp. Secondly, a small aperture would give me a longer exposure time in order to catch the lightening and to allow the low-light glow from the buildings to be recorded. The image above was taken with a 15 second exposure at F10 and ISO 125. It wasn’t easy to get and it took about 30 shots to get one I really liked. During these electrical storms you need to set up your camera on a tripod, set the shutter and aperture to allow for a long exposure (depending on how frequent the lightening is), and use a cable or remote release if you have one. For frequent lightening, you can aim in the general direction and take exposures of between 5 and 15 seconds until you get a shot you like. For more infrequent lightening, you may need exposures of 15 seconds to a couple of minutes as you cannot judge when it will strike and you don’t want to miss one! Don’t be disappointed if you don’t get it right straight away, just keep trying. 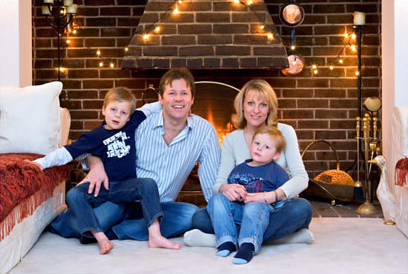 Now, look at the shot below of a family by a nice roaring fire. You may be mistaken for thinking that this was taken with a studio set up with lighting all around. In fact this was taken with just an SLR camera, tripod and single speedlight. I will let you into a secret on how to get this type of shot with just basic equipment and a good knowledge of shutter speeds. Ok. A basic and direct flash shot would normally give harsh shadows against the back wall, a faster shutter (60th/sec +) and smallish aperture, meaning that the fireplace and fire in the background would be extremely dark and not very inviting at all. To get the shot as it is, with the family well lit, no harsh shadows and the fireplace with a cosy and "warm" feel to it, I set the shutter speed to a very slow 1/3rd/sec at F5.6 with an ISO of 200. I also bounced the flash from the ceiling at an angle of 45 to "diffuse" the light. This reduced the shadows completely and just gave the subjects a nice even spread of light. I had to ask the family to sit extremely still due to the slow shutter speed and took a bunch of shots and this one came out just right. The bounced flash lit the foreground subjects with a nice, even light. Then the slow shutter speed allowed the background details of the fireplace, flames and fairy lights to "burn" onto the image once the subjects had been captured by the flash. This just proves that you don’t need to spend an awful lot on money to get yourself started in portrait or wedding photography. You just need the knowledge and experience together with a good portfolio of varied images. Note: Once you have a decent portfolio, you will find that this gets your work coming in on a gradual and accelerating basis. Once you have a diary filling with sittings, you can start to increase your "hardware" with some lenses or studio lighting equipment. With practice, you will get to know instantly which shutter speeds are required for every occasion that presents itself. For the shots where you have a little more time to prepare, a good knowledge of how to use slow or fast shutter speeds will be to your advantage. It will add an infinite number of images or ideas for your portfolio or stock library.